Precious metals prices headed substantially lower this morning as European and Fed-related worries resurfaced with a vengeance only two or so weeks after markets envisioned certain developments to open up a one-way path to significantly higher prices. Spot gold fell to well under the $1,750 pivot point, losing about $23 per ounce in the process and showing a bid at $1,738 at last check, very near a fairly important support level (the next one comes around $1,723 per ounce). Silver dropped to under the $33.50 level instead of scaling new heights above $35 and $37 as had been expected. 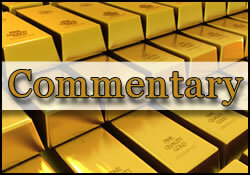 Physical gold demand remained "fairly limp" in the words of one senior MKS Capital trader. Traders in Mumbai noted that the seasonal demand "is still not materializing." Meanwhile, there is a steady (and increased) flow of scrap metal coming into the market on the heels of the recent Fed-driven rally. One Reuters News columnist reminded investors this morning that while the Fed’s bond-buying plans have crowded the ring with roaring gold bulls, the gold market need solid, palpable tonnage demand from India and China in order not to go down in history as a "flash in the pan." It is still unclear how much support to prices the spreading South African gold mine strike actions might come to provide. At the moment, some 40% of that country’s gold production capacity is being impacted by strike contagion that began with the now infamous Marikana incident. AngloGold Ashanti and Gold Fields are among the most prominent firms whose output has been suspended as workers have downed tools. However, we might note, even the much-vaunted Fed QE3 — the presumptive catalyst for the "upcoming moonshot" in precious metals — is beginning to show signs of having itself been a flash in the proverbial pan, news-wise at least. Questions surrounding its efficacy have now morphed into warnings about its… inefficacy. Enter Philly Fed President Charles Plosser: he said on Tuesday that the new bond-purchase program will most likely do nothing for US economic growth or for the still-struggling labor market, and it might put the US central bank’s credibility at risk, to boot. opposed the Committee’s actions in September because I believe that increasing monetary policy accommodation is neither appropriate nor likely to be effective in the current environment. Every monetary policy action has costs and benefits, and my assessment is that the potential costs and risks associated with these actions outweigh the potential meager benefits." Meanwhile, the wild ride in platinum-group metals continued unabated, with platinum trading at $1,610 — almost $100 under its high two weeks ago — and with palladium bid at $620 — about $75 under its recent peak in prices. Rhodium, which had been hit hard earlier in the week, traded unchanged at $1,125 the ounce this morning. In the market’s background traders noted a 1.44% decline in black gold (breaching the pivotal $90 per barrel mark) and a sizeable slide in copper. The US dollar advanced 0.25% on the trade-weighted index, reaching 79.92 at last check. Spain’s borrowing costs spiked to just above the 6% mark (with Italian ones playing catch-up pretty fast) as the perception that the eurozone ECB bond-buying plan might not be the "whatever it takes" measure that gets things back on track in the Old World. Rumors that Catalonia might wish to go its own way and no longer be part of Spain (?!) swirled in the markets this morning. The rumors turned out to be closer to the truth than one might expect; the province’s president, Artur Mas, has called for snap elections come November 25th and has given hints that he wants to be… mas autonomous from Spain. Oops. Meanwhile, Spanish PM Rajoy is seen as "hoping " to delay a Spanish rescue until things get similarly bad (or worse) over in neighboring Italy, so that he might obtain more "bargaining" power. Oh, boy. Such jitters actually came to impact the success of the most recent German bond auction; bids fell short of the target of five billion euros. One ECB executive board member said that his institution would not participate in a restructuring of Greek debt. There you have it; the "sure thing" of just a few short weeks ago — one that lifted the euro to some "interesting" (but evidently untenable) levels has morphed into the "not so sure anymore" one. And, just in case you were convinced that Greece had sailed into calm financial and social waters, behold the first big anti-austerity strike in that country since the new coalition government took the reins over in June. More than 50,000 angry protesters took to the streets of Athens today, chanting slogans about not submitting to to what they call the "troika of lenders" and warning that they basically cannot take it any longer. Greek police reportedly fired tear gas at demonstrators, some of whom were already in tears about their families’ inability to make ends meet. Does this image rattle some nerves in distant markets? In The Lead – Maybe We Should Pay Greece With Bitcoin? Every time the metals dip old Jon emerges from his hidey hole with a leading sentence like this one, “precious metals prices headed substantially lower..” May I add, ” so has my opinion of you”, if that is even possible. I hope you short gold all the way to $5000 an oz. he should quit this job. always predict and gathered news from those bear people. and never correct once.